Tofu has to be firm and fresh. Press out the water with a towel. Cut the tofu into large pieces. 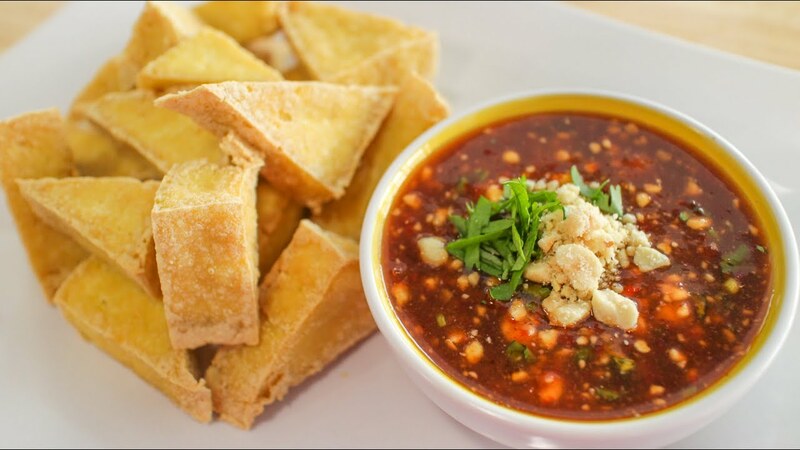 Heat the pan, add oil, deep fry the tofu until golden brown, and serve it hot with peanut dipping sauce in a plate. In a large bowl add sugar, vinegar, ground fresh chili paste, salt, and vinegar. Heat it for a minute in the microwave until the sugar is dissolved and stir the sauce so that all the ingredients mix well. Add the toasted crushed peanut and cilantro as a garnish. Grind the lemongrass, garlic, ground pepper, cilantro and salt in the food processor. Place the chicken and ground ingredients in a big bowl allow it to marinate overnight or leave it in the refrigerator for an hour. Grill the chicken for an hour on medium low heat or grill the chicken on wood charcoal, which is the authentic way of preparing Thai grilled chicken. Wash squash blossoms and drain the excess water. In a large bowl, mix the all purpose flour and baking soda. Dip the blossoms gently in the mixture one by one. Heat the pan with oil and fry the blossoms over medium heat until golden brown. Serve hot arranged on a plate.